The 18 bottle wine coolers represent excellent solutions for those wine enthusiasts that have small to medium size collections of wines and who don’t have access to a wine cellar. These wine coolers come in different sizes, and the available models can be so different regarding their characteristics that choosing the best one can become confusing. For this reason, we put up this list of 18 bottle wine cooler reviews to help you choose the best unit available on the market. But first, let’s see how to choose a wine cooler. On the market, there are so many models of wine coolers available that it is sometimes difficult to decide which is the right unit for you. For this reason, there are a few things you should consider before choosing a unit. First of all, you should decide if you want to preserve your wine, to chill it before serving or both. Depending on your intentions, but also on the diversity of your collection, you should decide what features to look for in a wine cooler. The thermoelectric wine coolers present the advantage of having a really quiet operation, making it possible to place them almost anywhere in your house. 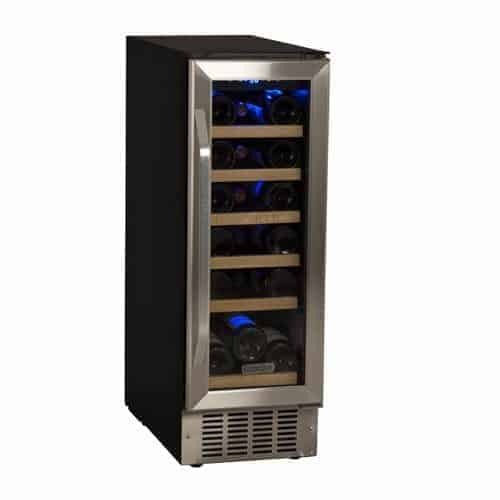 The temperature range usually varies between 45 and 65 degrees Fahrenheit, the units being suitable for the storage of both red and white wines.Because the internal temperature is always influenced by the external temperature, these units might be unsuitable to be placed in hot environments and they might not chill your wine properly before serving.Typically, these units are ideal for preserving the wine, as the low level of vibration will not disturb the wine’s sediment. If you live in a warmer climate or if you want to use the wine cooler for chilling purposes, you should probably opt for a compressor wine cooler. Similar to the regular refrigerators, these wine coolers have a superior cooling capability but they are noisier and produce more vibrations.These units are more suitable to be placed in the kitchen and they come in various options including built-in, countertop or freestanding units. As the name says, these units maintain the same temperature in the whole interior. Typically used for preserving the wine, the single zone wine coolers are a suitable solution for you if you have a collection composed of a single variety of wine. These wine coolers also represent suitable storage options for the homemade wine. These dual zone fridges are suitable for those who have different wines that must be preserved at different temperatures. Usually one zone provides a lower temperature than the other, being suitable for preserving both white or sparkling and red wines. These wine coolers can also be a versatile two-in-one preserving and chilling solution if you have only one type of wine since you will be able to place only one bottle in the colder zone. In addition to these considerations, you should also decide where you want to place the wine cooler. If you want to use it as an exhibition space for an expensive wine collection and place it in a living area, then maybe the best solution would be a thermoelectric countertop or freestanding unit. On the other hand, if you have a limited space and consider a built-in unit, know that almost all of them are compressor units and are more suitable to be placed in the kitchen. However, make sure to buy a unit that is specifically made for this purpose. Now, take a look at the 18 bottle wine cooler reviews and choose the right wine cooler for you. 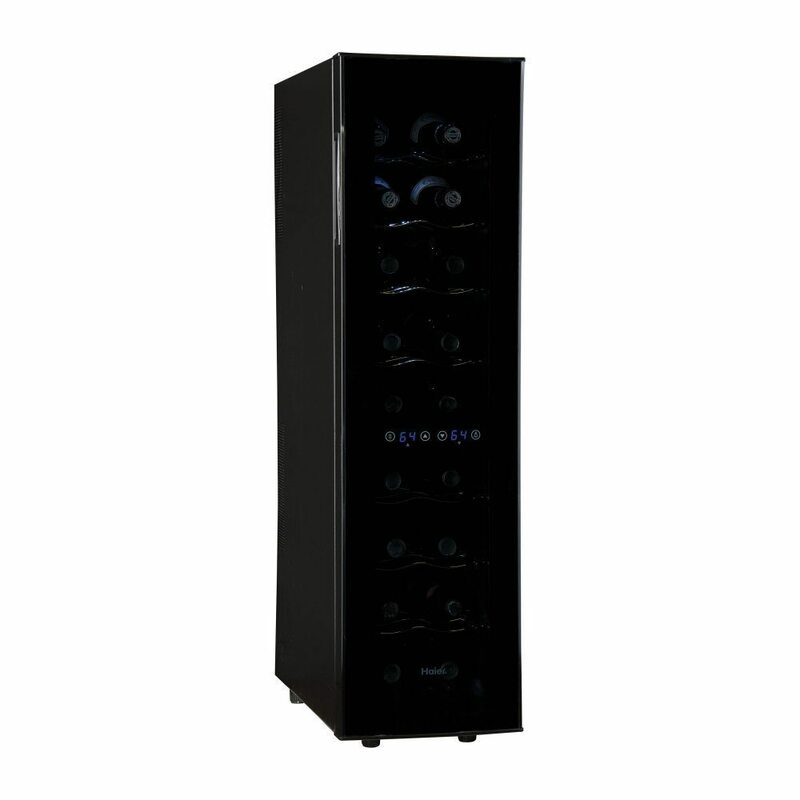 This Wine Enthusiast 18 bottle wine cooler impresses with its beautiful design that can enhance all the interiors. This freestanding unit uses the thermoelectric technology, being quiet and having a really low level of vibrations. The dual temperature zones will allow you to store both red and white wines, or to chill a few bottles before serving. Dual zone: the upper zone, with a capacity of 10 bottles, have a temperature range between 54 and 66°F. The lower zone has a capacity of 8 bottles and a temperature range from 46 to 66°F. Digital controls: setting the desired temperatures or turning the light on and off is easy, thanks to the digital controls. Upright bottle shelf: useful if you want to keep at serving temperature an opened bottle. The wine cooler seems to have a noisy fan and the customer support is not one of the best. 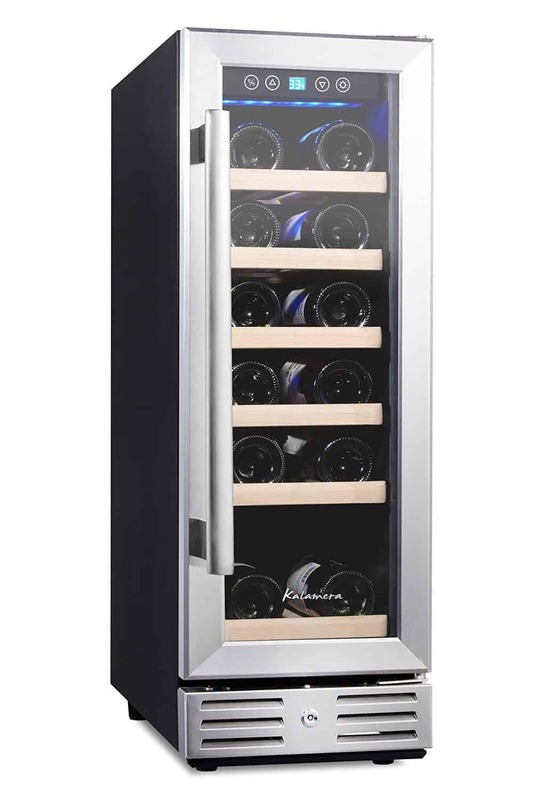 Whether you are searching for a freestanding or a built-in unit, this 18 bottle wine cooler from EdgeStar might be the right option for you. With a beautiful design, this wine cooler will add a touch of style to your interior, while the elegant wooden shelves enhance the aspect of the unit. Built as a single zone unit, this wine cooler represents an excellent choice if you have an increasing collection of red or white wines. Wide temperature range: whether you want to preserve red or white wines or to chill your wines before serving, you can select the right temperature between 40 and 65°F. Ultra-slim design: if you don’t have a lot of space, know that this unit will fit even in the narrower spots of your home. Black dot matrix glass: in addition to a beautiful stainless steel frame the door boasts a black dot matrix glass that will keep your wine safe from the UV light. It might be difficult to fit 18 bottles of wine in this unit. With a design very similar to the EdgeStar reviewed above, this built-in or freestanding unit from Kalamera has a width of only 12 inches, fitting perfectly in the narrower spaces. 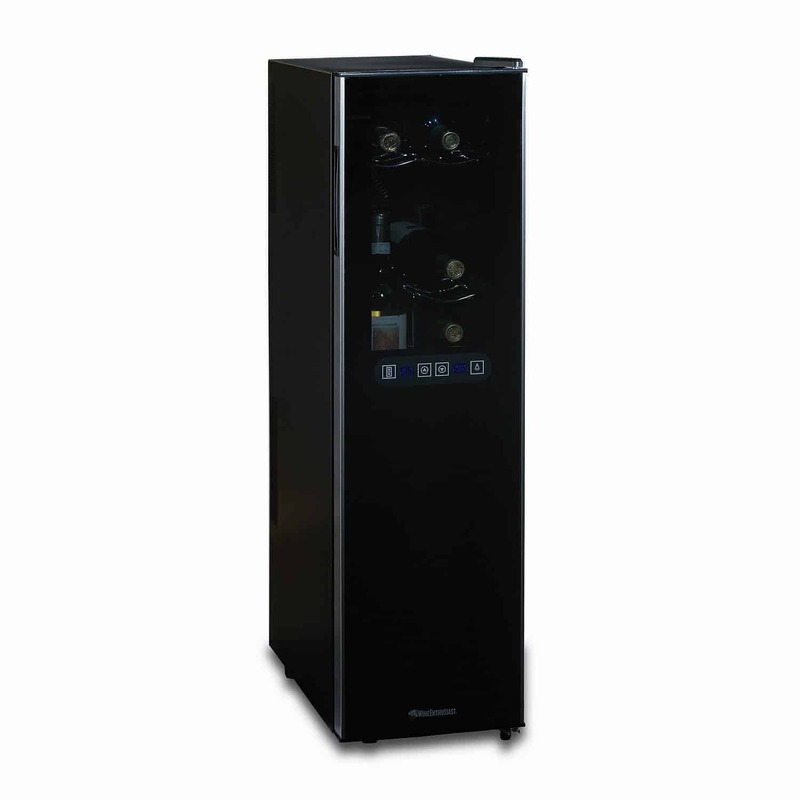 Even if it is a compressor wine cooler, the manufacturer used an advanced technology that reduces the noise and the vibration level, the user’s experience being similar to a thermoelectric unit. The temperature can be set between 40 and 66°F, the unit being suitable for storage or chilling purposes. Double-layer tempered glass door: to stabilize the cooler’s internal temperature and to prevent the glass from fogging, the unit is equipped with a double-layer tempered glass door. Touchpad controls: the temperature and light can be easily controlled thanks to the touchpad control panel. Safety lock: you can lock the door of this unit if you want to prevent any unauthorized access to your collection. The wooden shelves are not perfectly finished and the unit doesn’t come with a user’s manual. Haier is one of the wine cooler manufacturers that really care about the design of its products, and this freestanding wine cellar is really beautiful. The sleek design is enhanced by the modern curved door, while the smoked glass adds more class to this splendid wine cooler. 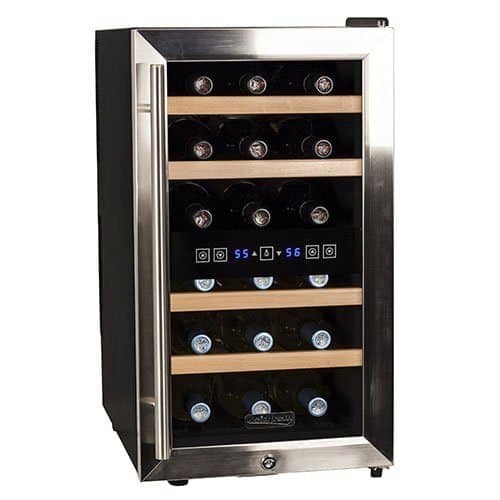 Using the thermoelectric technology, this unit is perfect for both red and white wines, boasting dual cooling zones. Dual-zone: the upper zone has a temperature range between 46 and 66°F, while the lower zone between 54 and 66°F. Dual touchscreen controls: this unit comes with a control panel designed for the easy control of both temperature zones. Internal light: the wine cooler has a pleasant soft blue internal light. The wine cooler is pretty noisy for a thermoelectric appliance. Another 18 bottle wine cooler that deserves your attention is this Koldfront freestanding unit that uses the thermoelectric technology. Compact enough, you can place this wine cooler directly on the floor or on the countertop. The beautiful design will make this unit fit perfectly even in the living area, while the safety lock will help you keep safe an expensive collection of wines. Dual-zone: the upper zone has a temperature range between 54 and 66°F, while the lower zone between 46 and 66°F. Both zones have a capacity of 9 bottles. LCD temperature display: it will be easy to control the temperature of both zones thanks to this feature. Elegant shelves: the wooden shelves make this unit suitable to be placed in your home office or living room. The shelves are rather small for the unit and they may fall if don’t pay attention. In our opinion, the best 18 bottle wine cooler available on the market is the Wine Enthusiast 272 03 18 05 18 Bottle Dual Zone Wine Cooler. We like this unit because it has dual temperature zones, it boasts an elegant design, and its thermoelectric technology makes it silent and environmentally friendly. 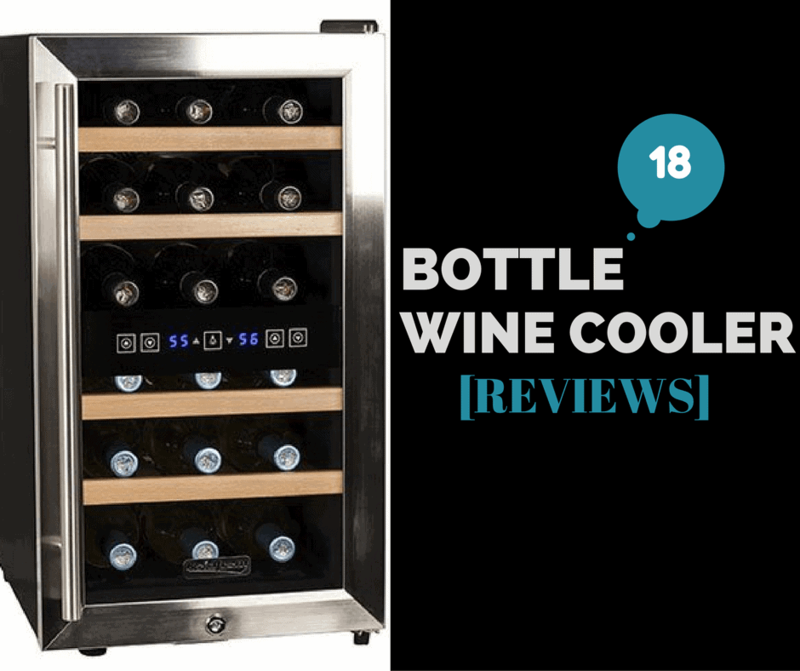 All these features, together with all the others described in the review, make us consider this 18 bottle wine cooler our favorite.